Takht Sri Keshgarh Sahib or Anandpur Sahib is one of the most important sacred places of the Sikhs and is closely linked with their religious traditions and history. It is located on the lower spurs of the Himalayas surrounded by picturesque natural scenery, with the river Satluj forming a shimmering and shiny blue border on the south west barely four miles away. So far as the historical significance of Anandpur Sahib is concerned, it is second only to Amritsar, the city of Golden Temple. Anandpur Sahib was founded in the year 1665 by the ninth Sikh Guru, Guru Tegh Bahadur, near the ruins of an ancient place, Makhowal. On May 13,1665, Guru Tegh Bahadur went to Bilaspur to attend the mourning for Raja Dip Chand of Bilaspur State. The Dowager Rani Champa of Bilaspur offered to give the Guru a piece of land in her state. The Guru bought the site on payment of five hundred rupees. The land consisted of the villages of Lodhipur, Mianpur and Sahota. Here on the mound of Makhowal, Guru Tegh Bahadur raised a new habitation. 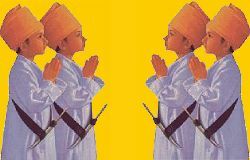 The ground was broken on June 19, 1665, by Baba Gurditta Randhawa. The new village was named Chakk Nanaki after the Guru's mother, Nanaki. The place later came to be known as Anandpur Sahib. The Takht Sahib proper is a square hall with a balcony in front overlooking a spacious courtyard on a lower level. In the middle of the inner domed room are placed some weapons preserved as sacred relics. The space being limited on the top of the hill, the sarovar is on the plain ground west of the Takht Sahib. A large spacious pavilion is also around for larger congregation. Although the town is small but on the occassion of Hola Mohalla every year in the month of March it booms into boisterous activities and recaptures its old glory and splendor. Hola Mohalla : Anandpur Sahib comes to life every year on the occasion of Hola Mohalla. This tradition dates back to the times of the 10th Guru, Sri Guru Gobind Singh Ji. The Guru decided that the occasion of the festival of Holi, fun and frolic and colour splashing, be the occasion for the display of the martial spirit of his people and he gave this festival of Holi a more masculine name of Hola Mohalla. Each year Hola Mohalla marks the congregation of lacs of devotees from all over the country for a festival of colour and gaiety. Gurudwara Guru-Ka-Mahal (Bhora Sahib) : Residence of Sri Guru Teg Bahadur inherited by Sri Guru Gobind Singh Ji; the sahibzadas- the holy sons of the 10th Guru were born here. There is an underground room cut off from the din of life where the 9th Guru used to meditate. Gurudwara Thara Sahib : The 9th Guru used to deliver sermons from this raised platform. There is place to mark the spot where the Kashmiri Brahmins came to seek protection. Gurudwara Sis-Ganj Sahib : In November, 1675, the martyred head of the 9th Guru which was heroically brought by Bhai Jaita ( Bhai Jiwan Singh after taking holy nectar according to Sikh rites (baptism) in exultant defiance of the Mughal authorities was cremated here, ceremoniously. Akal Bunga : After cremation of the holy head of his father, followed by a prayer to the Almighty, the 10th Guru had rested here with his relations and followers. Gurudwara Damdama Sahib : The 10th Guru was given the Guru Gaddi, here. It was from here that he had declared the end of the institution of the Masands-the priestly agents of the former Gurus. Gurudwara Manji Sahib : The Sahibzadas received their education and military training at this spot. Military exercises were also rehearsed here. Gurudwara Takht Sri Kesgarh Sahib : In 1699, on the occasion of the festival of Baisakhi, Guru Nanak's mission was fulfilled by the 10th Guru, Sahib Sri Guru Gobind Singh Ji, when, through baptism of the double-edged-sword the Sikh was consummated as the Khalsa-Saint Soldier- in direct commune with the Guru and God. Still more astonishing is the fact that the Guru had got himself baptised by the Panj-Pyaras, the five beloved ones, who had offered him their heads to uphold Dharma - the righteous cause. 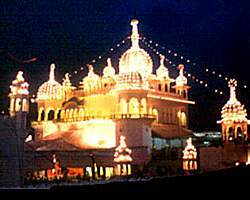 Guru-Ka-Lahore : It is 11 kms on Sri Anandpur Sahib-Ganguwal route leading to the State of Himachal Pradesh. On 25th January, 1686, the 10th Guru's wedding to Mata Jito Ji was celebrated here. Two almost pinhead springs still functional, were pierced by the 10th Guru by lancing the rocky mountains. Gurudwara Mata Jito Ji : Not far from Holgarh Fort. Mata Jito Ji was cremated here. Bhai Ghanaiya Ji : His Baoli / Spring across the now almost dried up rivulet Charan Ganga and below the Taragarh hill, Bhai Ghanaiya Ji had anticipated the RED CROSS almost two centuries before its formation in the modern times. He used to render first aid to friends and foes, alike-something unknown in the world, then. 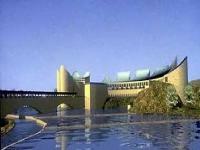 Virasat-e-Khalsa (formerly known as Khalsa Heritage Memorial Complex) is a museum located in Sri Anandpur Sahib. The museum gives an insight to the events that took place in Punjab five hundred years ago which gave birth to Sikhism and finally the Khalsa Panth. The museum throws light on the vision of the Gurus, the eternal message of peace and brotherhood which they delivered to the whole mankind and the rich culture and heritage of Punjab. The museum is intended to commemorate 500 years of Sikh history and the 300th anniversary of the Khalsa, the scriptures written by the 10th and last Guru of Sikhism, Gobind Singh, founder of modern Sikhism. Day 1. Early morning departure from Delhi for Chandigarh by Train. Pickup from Chandigarh Railway station and drive for Sri Anandpur Sahib hotel. Afternoon Visit Takht Sri Keshgarh Sahib Anandpur Sahib and Gurudwaras around Anandpur Sahib, night at Anandpur Sahib/Ropar Hotel. Day 2. Breakfast, morning visit Anandpur Sahib Virasat-e-Khalsa (Khalsa Heritage Memorial Sri Anandpur Sahib). Afternoon drive back to Chandigarh and drop at Railway station for Train for Delhi, reach Delhi late evening. For 2 Persons : Rs 4000 Per Person on Double sharing Room. For 4 Persons : Rs 3550 Per Person on Double sharing Room. For 6 Persons : Rs 3000 Per Person on Double sharing Room. Day 1. Early morning drive for Anandpur Sahib, reach Anandpur Sahib in the afternoon, Visit Takht Sri Keshgarh Sahib Anandpur Sahib and Gurudwaras around Anandpur Sahib, night at Anandpur Sahib/Ropar Hotel. Day 2. Breakfast, morning visit Anandpur Sahib Virasat-e-Khalsa (Khalsa Heritage Memorial Sri Anandpur Sahib). Afternoon drive back to Delhi, reach Delhi late evening. For 2 Persons : Rs 5050 Per Person on Double sharing Room. For 6 Persons : Rs 3750 Per Person on Double sharing Room. For 8 Persons : Rs 3200 Per Person on Double sharing Room. Day 1. Early morning departure from Delhi for Chandigarh by Train. Pickup from Chandigarh Railway station and drive for Sri Anandpur Sahib hotel. Afternoon Darshans of Takht Sri Anandpur Sahib and Gurudwaras around Anandpur Sahib, night at Chandigarh hotel. Day 2. Breakfast, morning drive for Gurudwara Fatehgarh Sahib, Darshans of Fatehgarh Sahib and other gurudwaras of Fatehgarh Sahib, afternoon drive back to Chandigarh and drop at Chandigarh Railway station for Train for Delhi, reach Delhi late evening. For 2 Persons : Rs 4500 Per Person on Double sharing Room. For 4 Persons : Rs 4000 Per Person on Double sharing Room. For 6 Persons : Rs 3500 Per Person on Double sharing Room. Day 1. Early morning drive for Anandpur Sahib, reach Anandpur Sahib in the afternoon, Darshans of Takht Sri Anandpur Sahib and Gurudwaras around Anandpur Sahib, night at Chandigarh hotel. Day 2. Breakfast, morning drive for Gurudwara Fatehgarh Sahib, Darshans of Fatehgarh Sahib and other gurudwaras of Fatehgarh Sahib, afternoon drive back to Delhi, reach Delhi late evening. For 2 Persons : Rs 5600 Per Person on Double sharing Room. For 4 Persons : Rs 4600 Per Person on Double sharing Room. For 6 Persons : Rs 4000 Per Person on Double sharing Room. For 8 Persons : Rs 3400 Per Person on Double sharing Room. For 10 Persons : Rs 3000 Per Person on Double sharing Room. Day 1. Early morning drive for Anandpur Sahib, reach Anandpur Sahib in the afternoon, Darshans of Takht Sri Anandpur Sahib and Gurudwaras around Anandpur Sahib, night at Anandpur Sahib/Ropar Hotel. Day 2. Breakfast, morning visit Anandpur Sahib Virasat-e-Khalsa (Khalsa Heritage Memorial Sri Anandpur Sahib). evening drive to Chandigarh night at Chandigarh hotel. Day 3. Breakfast, morning drive for Gurudwara Fatehgarh Sahib, Darshans of Fatehgarh Sahib and other gurudwaras of Fatehgarh Sahib. Afternoon drive back for Delhi. Reach Delhi late evening and drop at your destination. For 2 Persons : Rs 6000 Per Person on Double sharing Room. For 4 Persons : Rs 5500 Per Person on Double sharing Room. For 6 Persons : Rs 4750 Per Person on Double sharing Room. - The City Of Spiritual Bliss. - Anandpur town was founded by Guru Tegh Bahadur Sahib on June 19,1665. - Here, Guru Gobind Singh baptised the first five Sikhs called the Panj Piares, the five beloved ones in 1699 and created the nucleus of the Khalsa. - Hola Mohalla festival is celebrated at Anandpur Sahib. On this day Anandpur Sahib relives the martial splendor of the Khalsa under their great Guru. - Located about 95 kms from Chandigarh.